I am not a morning person. Which means I am not so much of a breakfast person either. But now with lil V around, I wake up earlier than what I am used to, to make a hot breakfast morning every day. It is sort of our bonding time as well, before he heads off to daycare. It is also during these breakfasts that his grandparents come on skype to see him and it has evolved into family time now. I love to cook different things for lil V and knowing that I am introducing new flavors to him and getting him accustomed to lots of different tastes and flavors and textures is very satisfying for me. I love to feed people good food. That combined with the motherly instinct to nurture – I take it all out on V. I am pretty sure that he is not complaining about this. Even though I try different menus for breakfast and he likes most of them, he still has a few favorites, which are waffles, pancakes and eggs! I have added a new favorite food to his vocabulary, which is, chia (he says “chija” though). He knows it when I take out that mason jar from the refrigerator, that is is his favorite oatmeal chia pudding and starts saying “chija chija” at the top of his voice, till I give him some. I love that I am bringing up a little foodie in this house. When I attended the International Food Bloggers Conference (IFBC) last weekend, Nature’s Path Organics’ Qia breakfast cereal mix of Chia, Buckwheat and Hemp was part of our swag. I checked out their website and they have this in a couple of other flavors as well – Apple Cinnamon and Cranberry Vanilla. 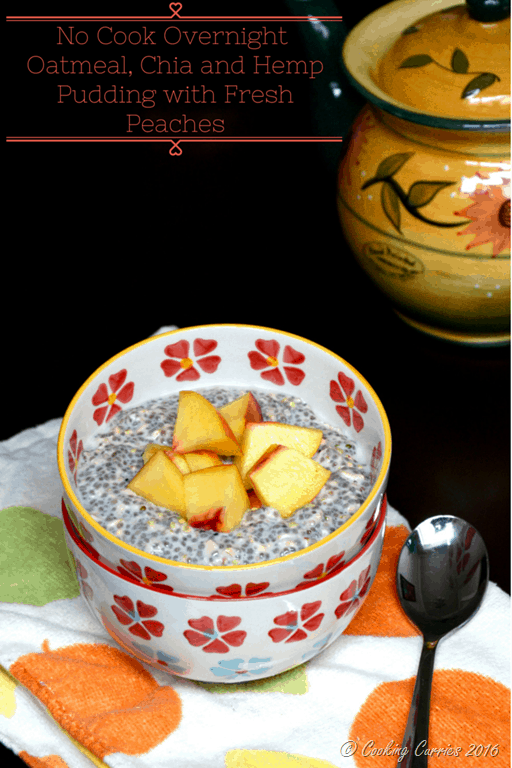 Since I was making my oatmeal chia pudding quite often, I decided to try this one as well as it had hemp and buckwheat to it as well. I did not use all of it though. I used oatmeal, some plain chia, some of this mix, mixed it up with some vanilla almond milk and left it in the refrigerator overnight. I was afraid that it might become too mushy because of the buckwheat but it wasn’t. 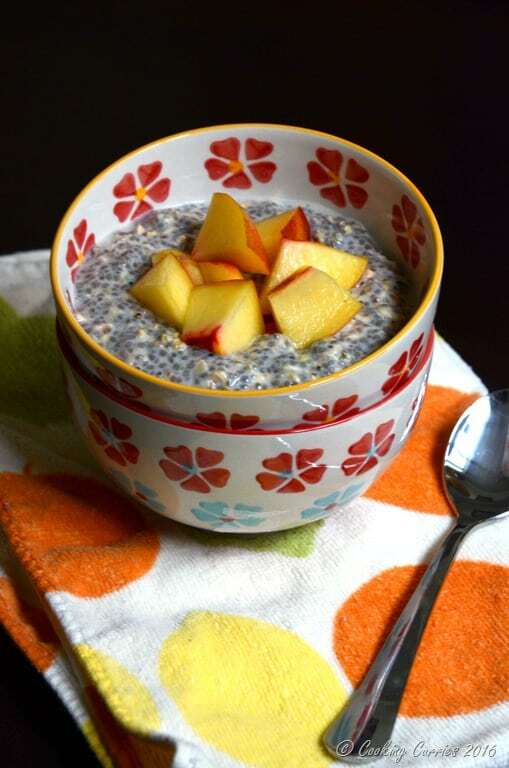 In the morning, I added some more of Qia breakfast cereal mix into my pudding just before eating, to get a little bit of that crunchiness from the hemp seeds. 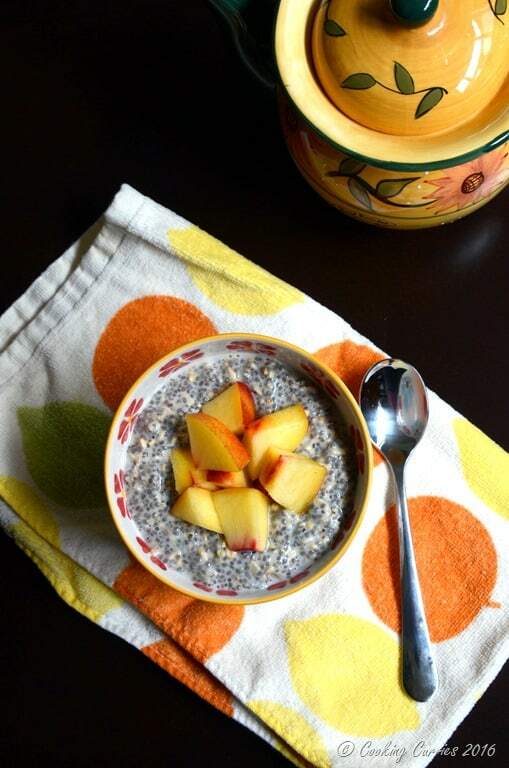 It was a burst of texture with every mouthful – a little bit of the soft mushiness from the soaked chia, oatmeal and buckwheat and the crisp bite of fresher hemp. Without much (any more) ado, here is the recipe for this morning pick me up pudding. 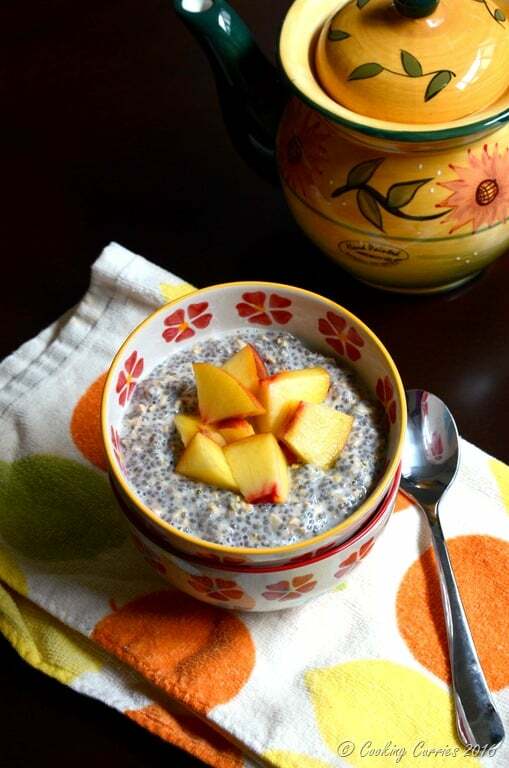 Toss the oatmeal, chia and Qia (divided equally) into two mason jars / any other jars. Pour the almond milk over it. Give it a quick stir and store in the refrigerator overnight. In the morning, about 5 minutes before eating add the extra 2 tbsp of Qia and give a quick mix. Add more almond milk, if needed. Disclaimer: I attended this conference at a reduced rate in exchange for at least three blog posts about #ifbc. All opinions are however mine and mine only.